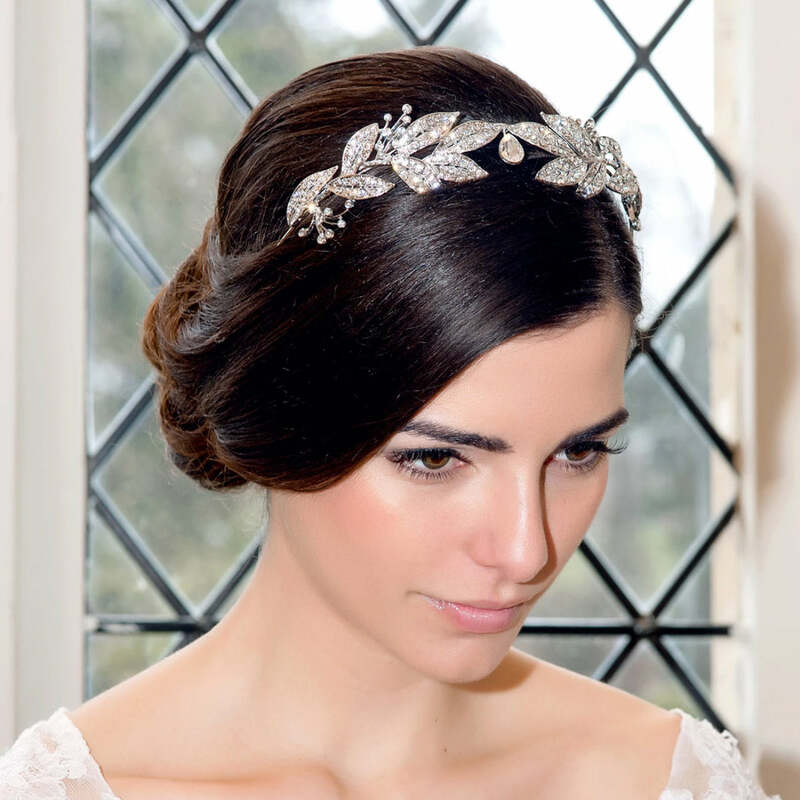 As featured on Downton Abbey, this beautiful 1920s laurel leaf Grecian tiara is a must own. Our beautiful Vintage Wreath Tiara is a favourite with brides who adore vintage style. Tiaras are thought to originate from the laurel wreaths worn by the ancient Greeks and Romans and, with this exquisite piece featuring intertwined crystal adorned laurel leaves with a centre crystal droplet, it beautifully combines Grecian influences with timeless style. With looped ends for securing fastening to the hair with pins or kirby grips, this sparking headpiece can be worn to dress a chic up-do for elegant style or, for a romantic look, in loose tumbling tousled locks. GS Stylist Says... "I love this tiara. Worn in cascading curls and with an Empire line gown, it will certainly transform you into a Grecian Goddess Bride. For a more timeless style, it dresses an elegant up-do with class. In fact, one of the most famous laurel wreath tiaras is owned by the Orange-Nassau family and was worn by Princess Laurentien at her wedding in 2001. Her style was classic proving just how versatile this style of tiara is." This tiara was just perfect for my wedding. It is gorgeous in person. It is shiny and vintage looking and pulled my whole look together. It was totally worth it to spend a bit more for this beautiful piece. Comfortable too, it didn't bother me at all and you can bend it to make it fit perfectly. Loved it. It really looks expensive. This is an absolutely stunning tiara that can be worn either flat to the head like a headband or more upright like a classic tiara. Looks like it could have been passed down as an heirloom. I wanted a softer vintage look to go with my simple Art Deco inspired gown and I stopped looking when I found this beauty. This was perfect! No photo does it justice. I was nervous about ordering online as it cost a lot of money and it wasn't what I was originally looking for but I spent ages looking over and over the photos in the bridal gallery and finally took the plunge and I am so glad that I did. I realised that you could wear it two ways, either flat to the head or with a slight lift (as in the model picture). I opted for the slight lift and it was comfortable enough, though it did feel like it was the wrong way round. It was sparkly but thanks to the darker shade of metal, it doesn't look cheap or tacky. It really was perfect! Bought this as I really wanted the tiara from Downton but it had a £125k price tag. But then I read in a bride magazine about this one which lady Mary wore in season 4 and thought £88 was much more reasonable. It's very pretty, very expensive looking and and isn't light and flimsy but not super heavy at the same time. Would absolutely recommend ordering it. I agree with the other reviewers who have said that the photos really do not do this tiara justice. It's absolutely beautiful. I'll be wearing it to my wedding. I can't wait to show it off! This headpiece is just stunning in person - it's very heavy and looks much more expensive than it is. Very sparkly! I can't wait to wear it on my wedding day! Wow even more sparkly than I imagined it would be. I was looking for something with a vintage feel, that would make a statement and this ticks both boxes and more, I love it. It has an ancient goddess feel to this tiara I wish I could wear it everyday. Also thanks for speedy delivery. This is out of this world, the image does it no justice, I am in love with my tiara, a must! Truly beautiful, the photo does not do this tiara justice. A real knock out piece. Was shocked and amazed to see in real life. The quality is amazing and it really shines. My dress is very plain and wanted something to set it off. I am that impressed with the quality and service i am planning to get the earrings and necklace to match. Its a very special piece and i can't wait to wear for my wedding in November. I never usually write reviews but I received my head band today I love it so much I felt it deserved a review! The pictures do not do it justice, it's beautifully made a decent weight, not flimsy! I shall be wearing across my forehead for a more Grecian look, it's exactly what I wanted I haven't seen anything else like it! Delivery was also next day! I can't wait to wear it, thank you Glitzy Secrets!